From Goodreads.com: Declan Bennett has zero tolerance for thieves. He and his brothers, the Keepers, are fiercely protective of their witch, Sienna, and their privacy. So when Kate Carrigan breaks into their estate, he'll be damned if he lets the little wildcat get away with it – especially after she seduced him three months ago, leaving him buck-naked in a New Orleans hotel. 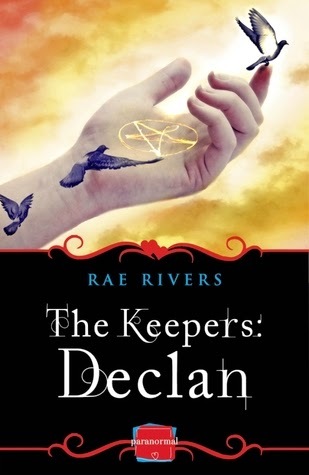 Declan wants payback – and some answers. After reading the previous novels in this series, I was eagerly awaiting this one - and thrilled beyond belief when I was granted an advanced reader copy. Just as in the other stories, this one was well-written, engaging and full of action, chemistry and page turning events. Not only are the characters impossible not to like, but they are so completely believable that its hard to remember that this is in fact a paranormal novel, and that these things don't exist in the real world. Rae Rivers has a gift with words that allows you to not only be completely drawn into the world she has created, but to also be able to see the story in your mind as it unfolds. This book will definitely appeal to not only fans of paranormal romances, but regular romances as well. I can't wait for the next installment so I can continue on with this amazing journey. Thank you for the lovely review, Krystal. I'm so please that you enjoyed Declan's story!